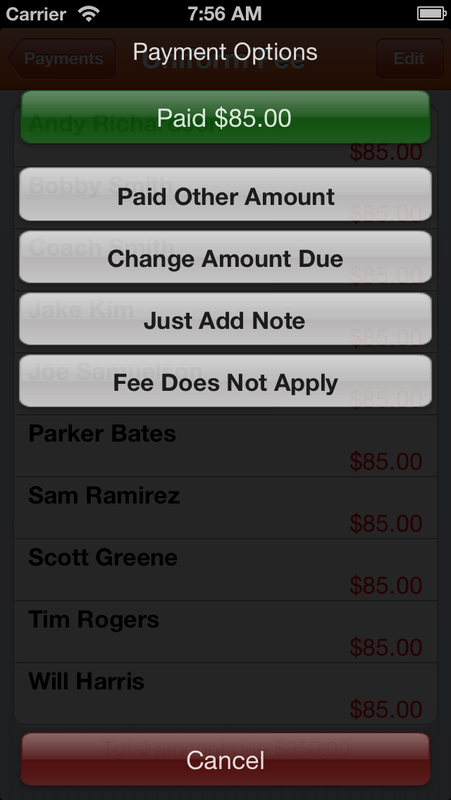 Payments – Now you have access to all your team payments information right at the field. See who’s paid, record checks as you receive them, adjust the amount owed or enter notes when someone tells you they’ll pay you next week (yeah right!). Item Tracking – The ever-flexible tracking tab from the TeamSnap website is now on mobile. Track those things you track, whether it’s waivers, volunteer spots or whose turn it is to wear the mascot costume. Availability Notes – Enter or edit the notes that go with availability, so you can see why people aren’t at the game or tell your coach you’ll be late due to that PTA meeting. Location and Opponent Editing – Need to change details about a location or opponent on the go … now you can! Club and League Division Browsing – If you’re one of our club or league commissioners you’ll no longer see all of your teams on the main screen, but instead have a handy division navigation structure. Much more convenient if you administer dozens or hundreds of teams. French Language Support – For our French-speaking customers, TeamSnap for iOS now speaks your language. If your phone or iPad is in French, TeamSnap will be too! And Many Bug Fixes and Tweaks – As with every release, we’ve made the app more reliable and stable for your TeamSnapping pleasure. We’re super-excited for you to take a whirl with the newest version of TeamSnap for iOS, so head on over to your favorite device and download or update today. Let us know how you like it!